Yall, get ready to indulge in all things custom made! I had the privilege of chatting with Danielle with Mason Dixon Designs, and you guys, she is not a force to reckon with. I wanted to get her input on a few topics and questions in regards to details on a clients wedding day. She, out of any other vendor, can truly customize a wedding in some of the most creative ways possible. Coming from a photographers stand-point, I wanted to see how we can not only elevate our mutual clients wedding, but also help in making a mutually beneficial relationship top priority. See below our interview together and make sure to read my thoughts on the interview after. P.S. The images that you will see in this blog post are not my images. Please see the verbiage written under each image to see which wonderful photographers shot which image. N: How did Mason Dixon Designs come in to light? How long have you been in business and what brought you into the wedding industry? D: I have been in restaurants my entire life. With this in mind, there was always a “Specials” board or a menu that I could design. I mean, honestly, I would much rather do that than to roll silverware. Later, I found myself working at TOPO in Chapel Hill. It was here that I got into events. Everything was in house, clients had a pretty moderate budget, we always pushed our in-house coordinator (which was myself) due to the clients budget. This is where I started to really dive deep in to the wedding industry. In 2014 my best friend got married at the Biltmore in Asheville. Since she was getting married at the Biltmore (which in itself was a high penny) she needed a calligrapher for her signage. She came to me because why spend money elsewhere when your best friend can do this?! Ironically, a few months after her wedding I receive a phone call from said friend stating that their wedding was going to be published in Style Me Pretty (swoon) and that in order for the vendors to get credited, they all needed a website, etc. So...I made a website that day and decided to call the business Mason Dixon Designs! As of January 1st, 2018 I went full time. In the past I had been working at other venues and with other planners around Raleigh, which helped me understand and expand to that market. N: What does your business specialize in? Why is this important to couples? D: We specialize in unique design details. We do it all-- signs, save the dates, bags, watercolor maps, seating chats. We can use any material. We really hone in on bringing personalized items to your wedding. We never do the same thing twice. It’s truly about the couple. We think, if youre going to spend the money, it might as well speak to you. N: Are there any trends that you see coming in to play in 2019? Have there been any trends that have sort of died since you began your business? Any that you are glad that have since passed? Ha! D: In the past 5 years or so wedding handwriting has been exploding. People are seeing tangible options for their wedding now. When I started there was this sort of pressure to do a traditional calligraphy type style. As a traditionalist, I appreciated this, but it’s important to stand out. If you are comfortable, try something else out. Listen to your gut and make tweeks. I am much more comfortable with being creative and showing thoughtfulness. Some trends that I see that are making its way in to the scene deal with textures, acrylic, things that help make acrylic stand out at a wedding, velvet (ohh velvet), handmade paper, fabrics, and alot more edgy weddings. I feel like within the next year or two we will be seeing impressions on velvet. I am excited to see all of the new ideas. N: I noticed on your website that when someone inquires on your contact page--you ask them who their photographer is. Why do you require this and why is it important to know who the photographer is? D: Tracking photos down is really hard work. There are a handful of photographers who send out the images. I have it placed on my contact page because later on, after their wedding, I don’t have to bother the client for it. I can just go straight to the source for imagery. It just saves a step. The photographer matters--if you are a photographer that I am familiar with--I will definitely text you and ask you for specifics. There are some that I trust with details over the others. This is so important to me. If there is a photographer that I know is going to get those key detail shots for me, I am a little more motivated to spend an extra 30 minutes at the set up to make sure things are EXTRA perfect and even throw in a few extra things. N: When you receive images from a wedding or styled shoot, what are the images that stand out to you? What are some that you typically do not use. Is there any advice from a calligraphers standpoint on what a photographer could do to help show your work in the best light? D: Styled shoots are great for me. I don’t have a problem with them at all. I can be a bit more creative and show off some nice ideas and play with new mediums. Wedding days are normally a little bit hectic, but these are the things that my clients paid for, so I want them documented. If a group of vendors are submitting a wedding for an editorial piece--they don’t want to see the pretty photos of the bride and groom...they want to see the details. So, why not take multiple shots especially of these tiny things that mean so much to our paying clients? We spent a lot of time talking about everything from ink color to font type, so it is frustrating when that work isn’t captured, even from a candid photographer. N: Have you ever received images from a wedding and you were just not that impressed? If so, why were you not impressed, or what was some thing that you wish the photographer could have improved on? D: There are just some situations that I know I wont get photos. I take extra shots on my iphone--to me, atleast I will have something. I would rather have 5 cell phone pictures of the setup than none. Everyone has a camera! We know good lighting and good angles. Pictures that come back and are dim, or details are out of focus are almost becoming inexcusable. Flat lay styling SO important!! If you can’t do it, I enjoy when photographers ask designers or myself to come style small details post-wedding to give us time and style it as it was envisioned. 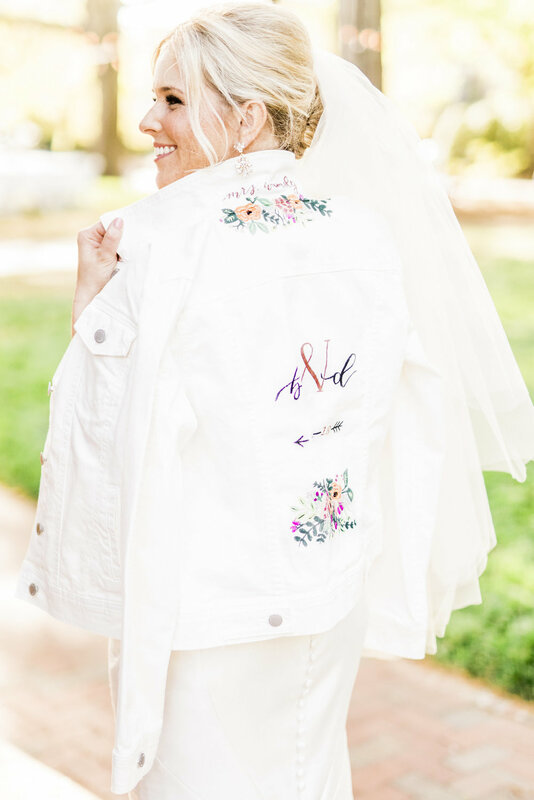 N: In our line of work styled shoots are a good way to meet other vendors, come up with a great idea, and get some beautiful images that all of the vendors could potentially use for marketing for the year. With this in mind, do you ever ask the photographer for certain images to make sure your line of work is seen properly? What are some things that just make you hella happy to see when the final images are distributed? D: Wedding day is more worrisome than styled shoots, because styled shoot purposes are for details. Styled shoot should emphasize multiple set-ups. 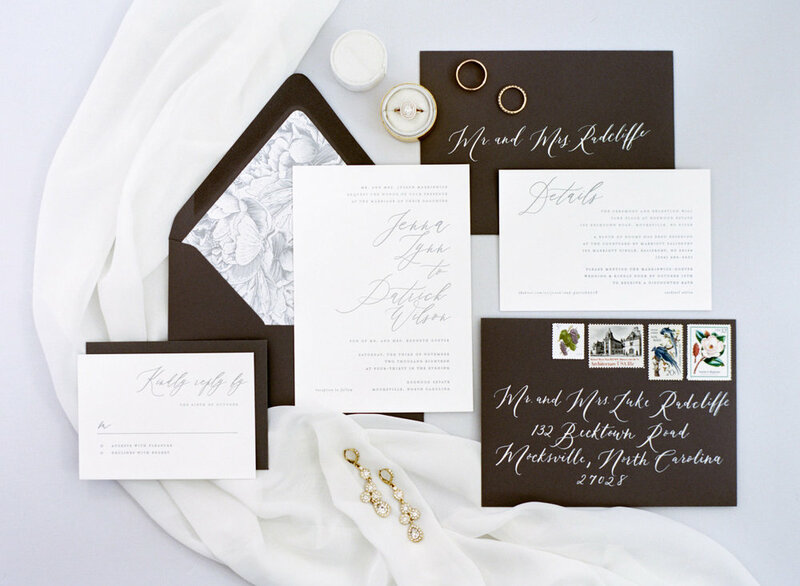 An invite suite just shouldn’t be styled one time with a few shots from the same angle. I should get up close of the rsvp, stamp detail, lettering work, maybe a different backdrop or two.I have different happy levels. I have a low happy level which consists of little to no detail images of my work. I then have a high level of happy which consists of atleast one picture of everything I did. On my end, the only thing that I, personally, have to showcase with after the wedding is pictures, so if you look out for me it just means the world. As far as my dream gallery goes? I love a gallery that shows different angles. It’s very selfish, but it makes me happy. 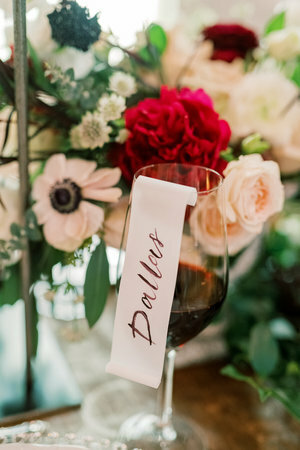 Think about it--a pulled back image that showcases the seating chart from head to toe in its cool little environment, then a closer one that shows off the calligraphy, even one that shows what the mirror looks like. All of these things work because I could make a collage or post multiples from the same wedding to show off all sides of an item. This is the stuff that makes me uber happy when I see it. So, I have to admit, some of the things that Danielle told me have really made me go back and look at how I have been serving my couples. It is always first priority to showcase my clients wedding day in the best light—as in, make sure to get those true moments and emotions. But, at the same time, it is also my job to photograph all of the details because…yeah, my clients paid for those details. Now, I typically do this (and I make sure even my second shooters are aware to photograph these certain items, as well), but, from what Danielle is saying—she would appreciate more angles of her work. I like that she mentioned to do a far away photo, along with a few close ups. This would give her more freedom to showcase what it would look like in a certain space. Before speaking with Danielle I just KNEW that she would mention that she wished more photographers were well versed in light so that when photographing special elements (like paper goods) she could see the details clearly. But, yall, this was never even brought up. As a photographer on the wedding day I am constantly going through lighting and figuring out how to document certain things to showcase perfect detail, etc., but Danielle mentioned that she doesnt even think of that. She just wants pictures so that she can share with other clients and potential clients. No perfection needed, she just needs these images to showcase her work. DUH Nikki! Just get out of your head—no one even knows if a photo is technically right.—just take the damn picture. Now, I will say that I am a bit shocked that she mentioned she sometimes does not receive images from the photographer. I see this alot with newer wedding photographers where they just are not aware of the power of sharing. As a vendor, to not ever see the gallery at all has to be a bit disconcerting. I feel that in order to have a truly great vendor relationship, we must all work together and shed light to each others business. Let’s be honest, as photographers we would not have all of the pretty things to photograph if it werent for these amazing vendors who do what they do. Now, I am not saying to give all of the images to all of the vendors with full printing rights and yada yada yada — all of the copyright law stuff, blah, but, I am saying that maybe it would be beneficial to share the work that these vendors have worked so hard on, even just for website and social media purposes. It’s something to think about, along with how you conduct your wedding day and capturing these special moments and details—like the details your clients have paid for. Be kind to your fellow vendors, they are in this to make their client over the moon happy, too. You can find more of Danielle’s work on her website MASON DIXON DESIGNS.